This guide provides instructions for installation, help on getting started and extensive documentation of features. It is recommended you read it thoroughly to fully leverage the theme's capabilities. Please also make sure to check out our Video Tutorials as they explain everything covered in here in greater depth. We hope you enjoy building with the theme as much as we enjoyed developing it and continue to develop with new features! WPFelix has supports for popular Jetpack plugin, and also provide free-customization if you don't want to use built-in Jetpack supports. Click on Create a new menu at the top of the page. Your new menu has been defined. Now it's time to add menu items. You can also set any menu as Primary menu at Manager Locations tab. 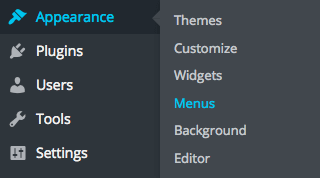 Note that the number of menu locations maybe different per theme. WPFelix supports 2 menu locations. Primary and Side. Side location requires Side Navigation and Show Menu on Side Navigation to be enabled. These options can be easily configured through Customize. Please read Customize Section for more details. 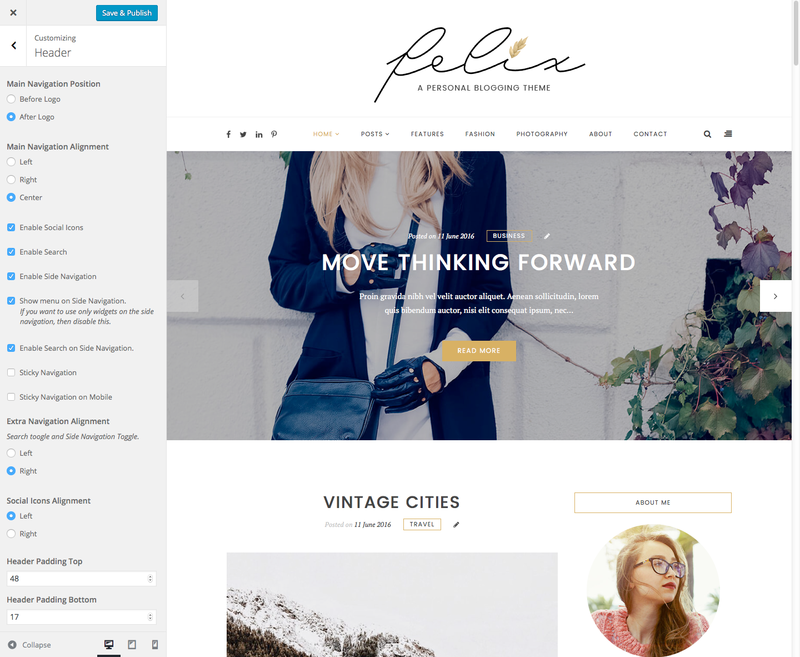 WPFelix comes with 5 pre-defined page templates. 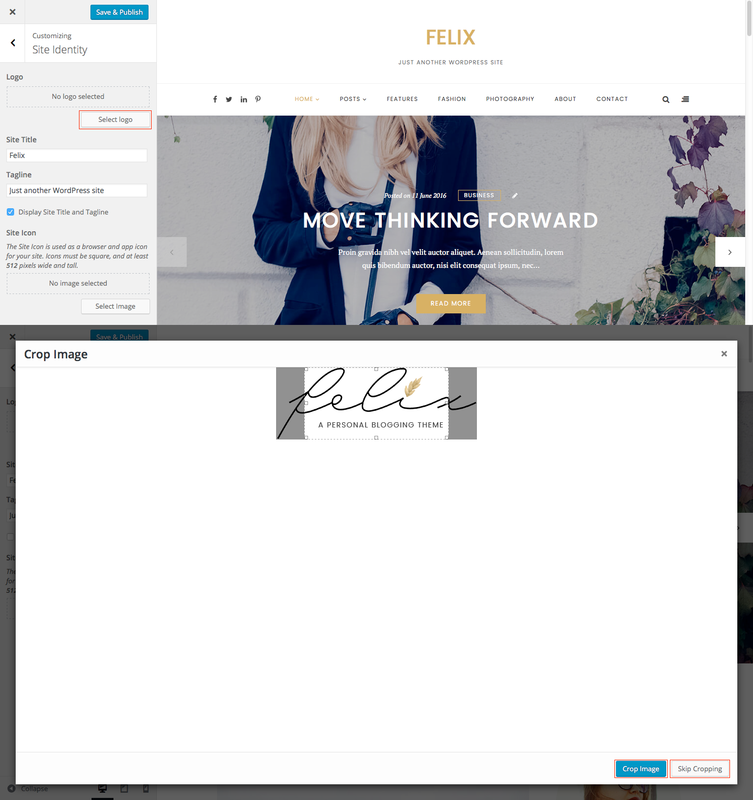 Default Template: The default, it's full width layout. Full Width Alternate: Full width with smaller container. Sidebar Left: Page with left sidebar. Sidebar Right: Page with right sidebar. No title: Page without title. 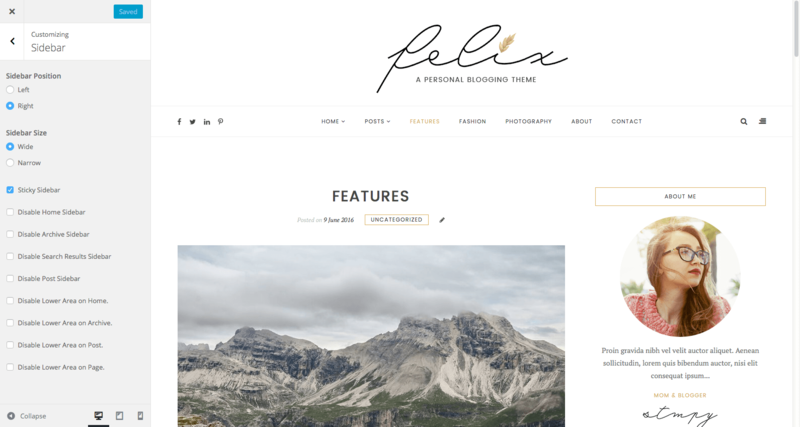 WPFelix supports 8 widget areas. Sidebar: Default widget area. Shows on Home / Search / Archive and single post. Pages: Widgets in this area will show on Pages. Aside Top: Widgets in this area will show on the top of Side Panel on the right side. Aside Bottom: Widgets in this area will show on the bottom of Side Panel on the right side. This area always be at the bottom, if Aside Top is too high or too short or even has nothing. Lower area Col 1 to 3: WPFelix also supports 3 lower areas before footer seperated by columns. You can put anything here. 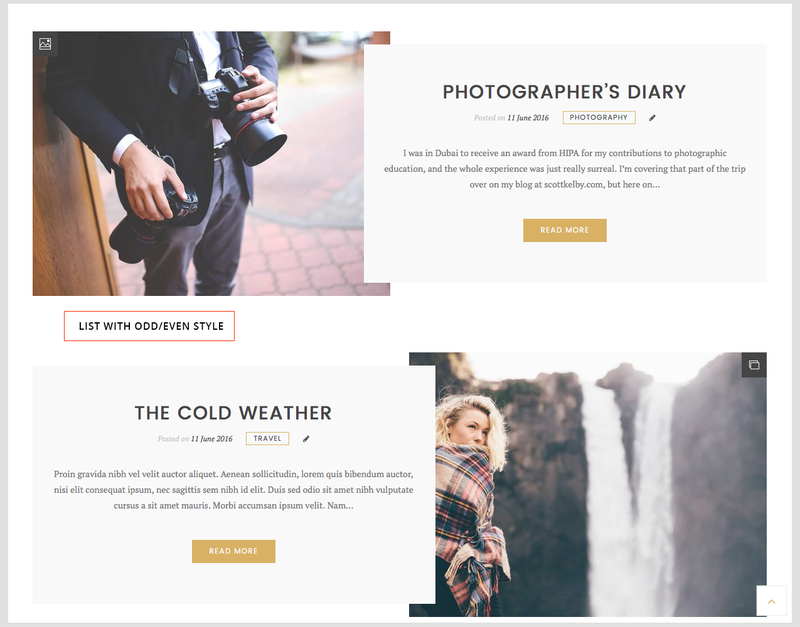 Footer Instagram: An optional widget area for instagram widget, which is cover full width of the site, shows at very bottom of the page, just before footer. 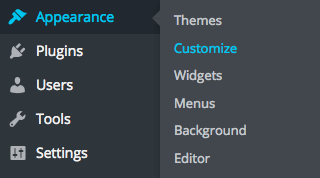 Navigate to Appearance > Widgets to access the list of widgets and widget areas that they can be added. The left hand side show all widgets you can use. The right hand side shows all different areas you can add widgets to. Simply drag and drop the widget you want into the area you want to the right hand side. When you finished, you can visit the site to see results. You can show/hide sidebars in some particular situations just by visiting Customize, of course you will need to login and have permission for it. You can access Customizer in two ways. From admin dashboard, go to Appearance > Customize. From admin bar in front-end view. After Customizer has been started, you will see it on the left hand side of the screen. You will want to hide text, just simply uncheck Display Site Title and Tagline. Or if you just don't want a logo, then check this and remove logo :-). Title and tagline can also be changed via these two fields as you can see bellow. Main navigation position: Make the main menu bar ( with social icons and stuffs ) shows before logo or after it. Main navigation alignment: Controls alignment of the main menu items container. Enable Social Icons: Show/hide social icons on the main menu bar. You will need to configure social profile links on the next section. Enable Search: Show/hide search form toggle on the main menu bar. Enable Side Navigation: Show/hide side panel area on the right side of the screen. If you enable this, all widgets on Aside Top, Aside Bottom area and Side menu location will shows up there. Enable Search on Side Navigation: Add search form to the top of side panel area. Sticky navigation: The main menu bar will stick on the top of screen if you enable this. However this only work on desktop screen. Sticky navigation on Mobile: There you go, make main menu bar stick on the top for mobile screen. Extra Navigation Alignment: Controls search toggle and side navigation toggle buttons on main menu bar. Social Icons Alignment: Controls social icons container. Padding Top and Bottom: If you want to strink logo area or expand it then change values here. Note that values must be integer number, and unsigned. Here you can add your social network profile links and icons will shows up. Both at header/footer and social icon widget. Just simply enter links ( URLs ) into the fields. Hold on, there's something more at the bottom. Scroll down and set your sharing options. This will allows people to share your writings on social networks. Check out posts list view ( home, archive ) or single view. Please note that sharing buttons only available for full/Grid with full style on posts list view, you can easily configure it in next section. Featured area only shows at home page. You can configure it here. 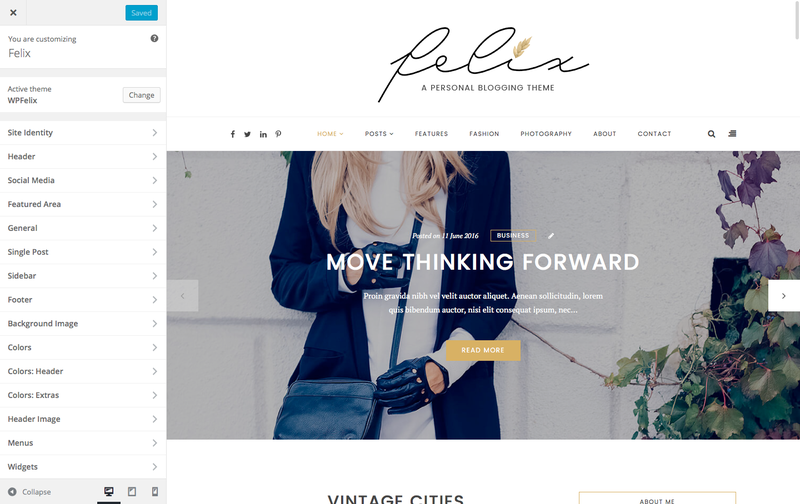 WPFelix supports 4 styles for this area, just choose one and check it out. Excerpt length in words count. Space before the slider, just in case you don't want it to be too close to main menu. If you don't want featured category name appears on any post info ( post meta ) then check this. Before we start, let's take a look at posts list layouts. Posts navigation type: Wordpress default is Older Posts and Newer Posts for pagination. 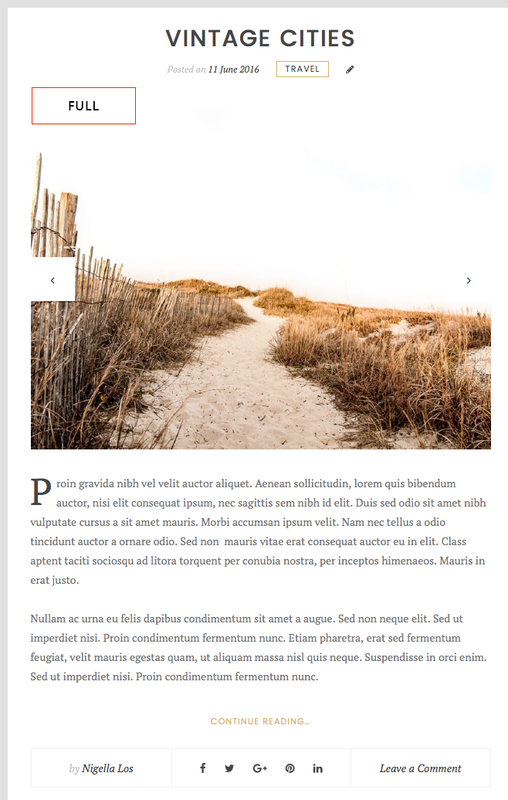 WPFelix provides additional page number style for it. 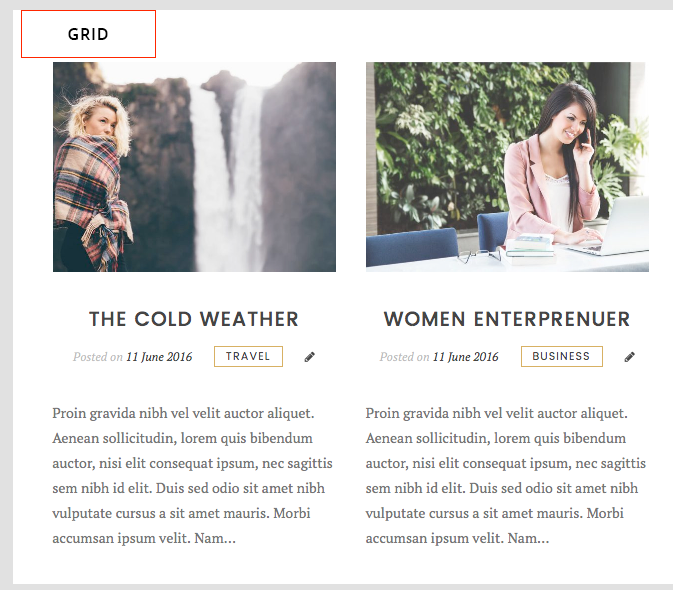 Grid Columns: Work for all grid-related posts list style. Full: Uses default read more behaviour by Insert Read More Tag at admin post edit screen. 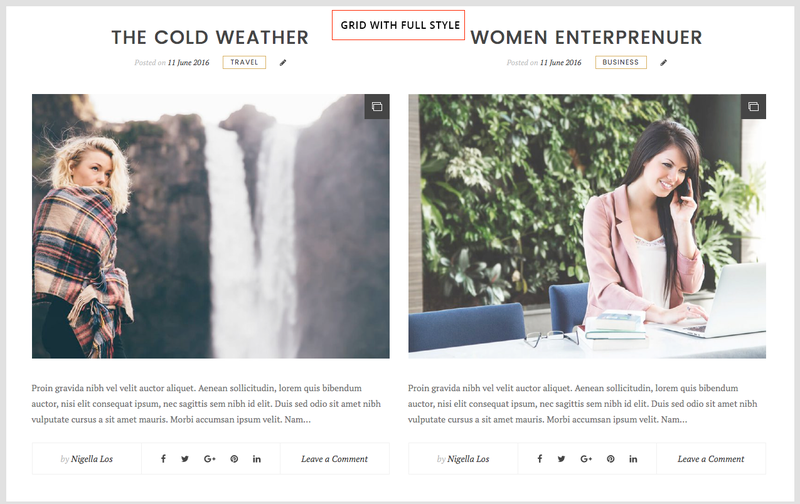 Grid will full style: Any type will work but disable sidebar for best view result. List with odd/even style: Excerpt or custom excerpt and also disable sidebar for best view result. Custom Excerpt Length: If you choose summary type to custom excerpt then enter number of words to show on posts list here. Show Post Categories: Show/hide post date on post info (post meta) on all posts. Show Post Author Name: Show/hide post author on post info (post meta) on all posts. Note that full and grid with full style also have this too. But grid and list style don't. Single post will also affected. Show Post Sharing Icons: Show/hide post date on post info (post meta) on all posts. Note that full and grid with full style also have this too. But grid and list style don't. Single post will also affected. Show Post Comments Count: Show/hide post date on post info (post meta) on all posts. Note that full and grid with full style also have this too. But grid and list style don't. Single post will also affected. Show Post Format Icon: Work for all posts layout styles exerpt the Full one. Built-in Post Views Count (Removed from 2.0): If you enable this, you will have an additional widget to show most viewed posts. You can also use plugin for that, just disable this and download a plugin that you need. From 2.0, the popular posts widget now require JetPack to be installed and connected. Wordpress.com will take care of your site stats as well as the widget. Back To Top Button: A button for quickly go to the top of page when scrolling down. Jetpack styles support: If you want to style your own jetpack modules then disable this. 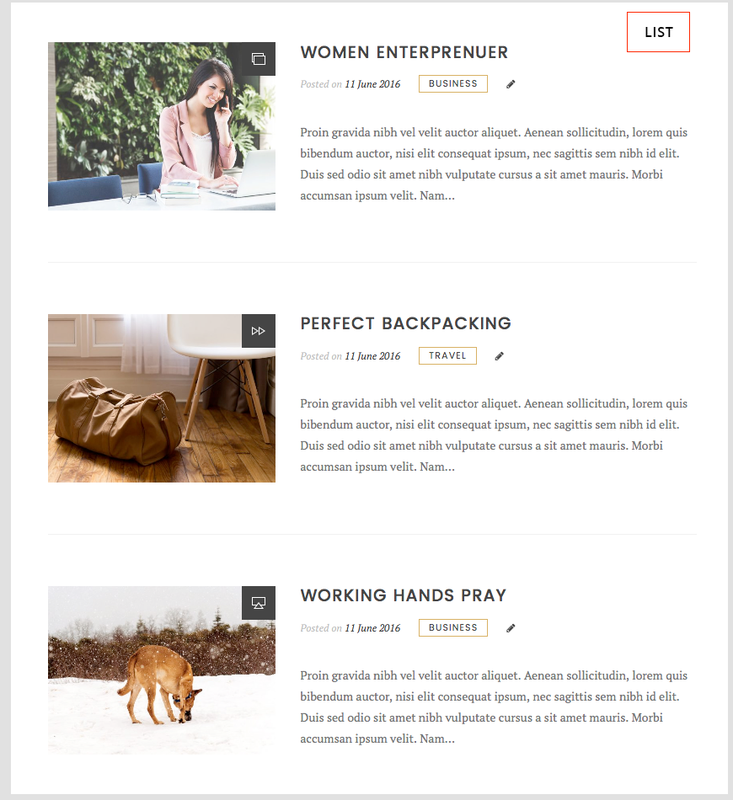 Post layout: If Full is selected then all sidebar option will be passed, and single post will show at full width but smaller container. Sticky Sidebar: Sidebar will be sticked when you reach the end of it but not end of main content area. Or top of it but not top of main content area. Sidebar Position: Left or right sidebar. 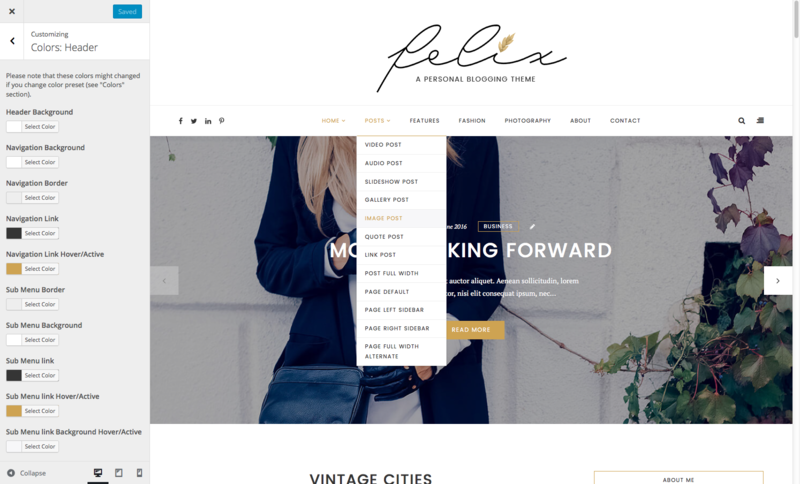 Sidebar Size: WPFelix supports two sizes for sidebar, just make change and check it out. Disable Home Sidebar: Show/hide Sidebar on home. Disable Search Results Sidebar: Show/hide sidebar on search results page. Please note that, the footer does not contain Instagram Widget, it's seperated from footer area. 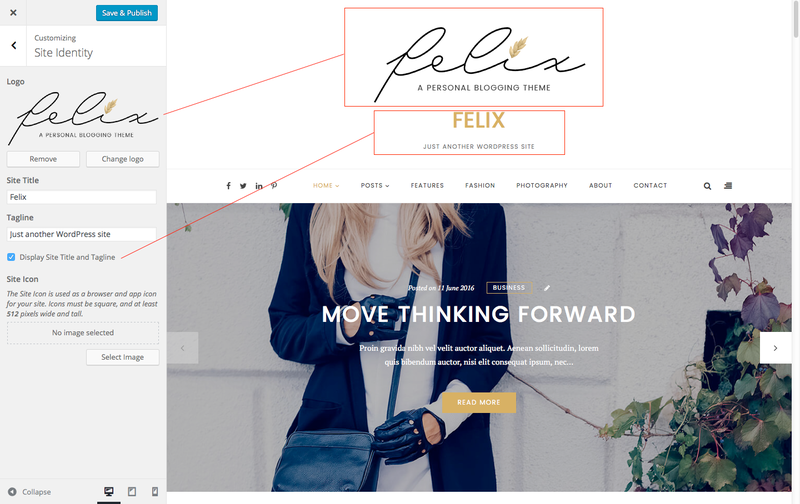 Footer Logo: Logo to be appear at the left hand side of the footer. This logo contains link to homepage. Footer Intro Text: Intro text appears at center of the footer. Copyright Info: Copyright info appears at very bottom of the footer. Show social icons: Show/hide Social icon at right hand side of the footer. You can customize social links at Social Media section. Footer padding top: Add padding top for the footer. Footer padding bottom: Add padding bottom for the footer. Set background image for the whole site. You select image by open Media Library or upload new, the process is just like selecting a logo. You can choose to repeat all, repeat horizontally or vertically or no-repeat, set position of the image and image attachment. Base Color Scheme - we built some presets for you to quickly get started. Choose one and start customize colors. Note: When changing color scheme, all colors customization you have made before will be lost and color preset for that scheme will be loaded. Background Color: Background color for the whole site. Highlight: Use for headings, some element backgrounds ( like subscription form, footer etc. ), and some other element text color. Accent: Accent color for the theme. Note post meta category, widget title will not use this color. Button: Button text color, by default button background will use accent color. Button Hover: Button text color on hover state. Button Hover Background: Button background color on hover state. Header Background: Background color for the whole header area. Navigation Border: Border top/bottom color for menu bar. Navigation Link: Menu item link color, affect both social icon colors and extra menu item colors. Navigation Link Hover/Active: Active/current/hover color for top level menu items. Sub Menu Border: Border color for dropdown menu Note that the top border color will always be "Navigation Link Hover/Active". Sub Menu Background: Background color for dropdown menu. Sub Menu link: Dropdown menu item link color. Sub Menu link Hover/Active: Active/current/hover color for dropdown menu item link. Sub Menu link Background Hover/Active: Active/current/hover background color for dropdown menu item link. This section contain extra colors for some elements. 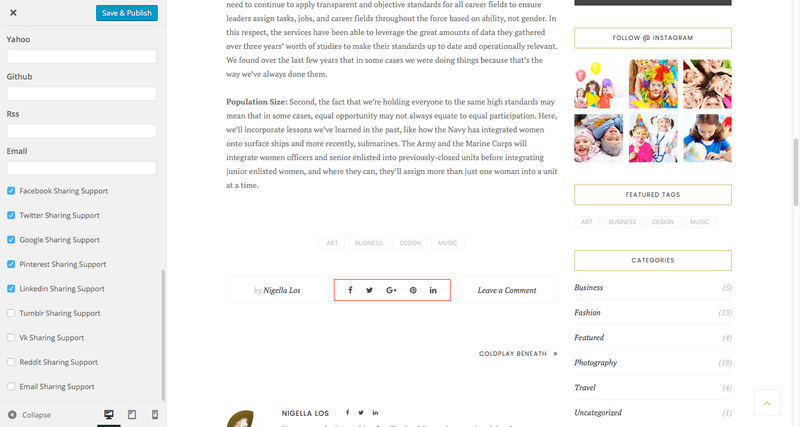 Categories Text: Text color for category link in post meta( under post title ). Categories Border: Border color for category link in post meta( under post title ). Categories Background: Background color for category link in post meta( under post title ), you can leave this blank for transparent color. Widget Title Text: Widget title text color. Widget Title Border: Widget title border color. Widget Title Background: Widget title background color. Footer Background: Footer background color. Footer Text: Text color on footer. Footer Highlight: Highlight color on footer. Footer Muted: Weak color on footer. 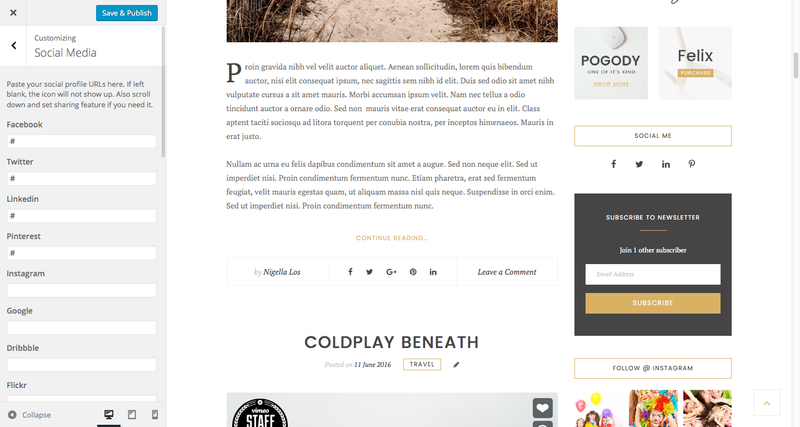 Footer Border: Footer border color, used for both footer itself and footer elements with border. Add/remove header background image. This process is just like choosing a logo. See Site Indentity Section for more details. 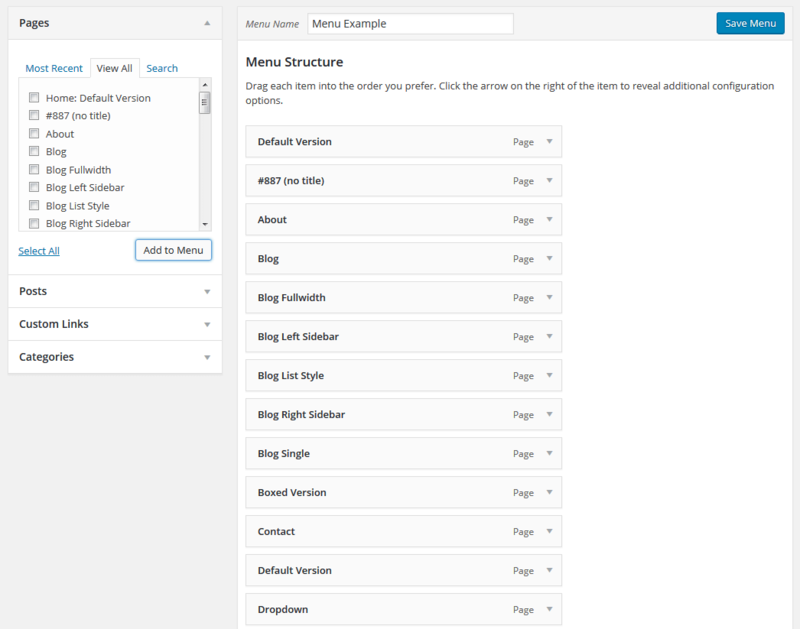 Select nav menu and location for the theme, these configurations are just like creating menu, add menu locations... at admin interface. See Menu section for detailed instructions. 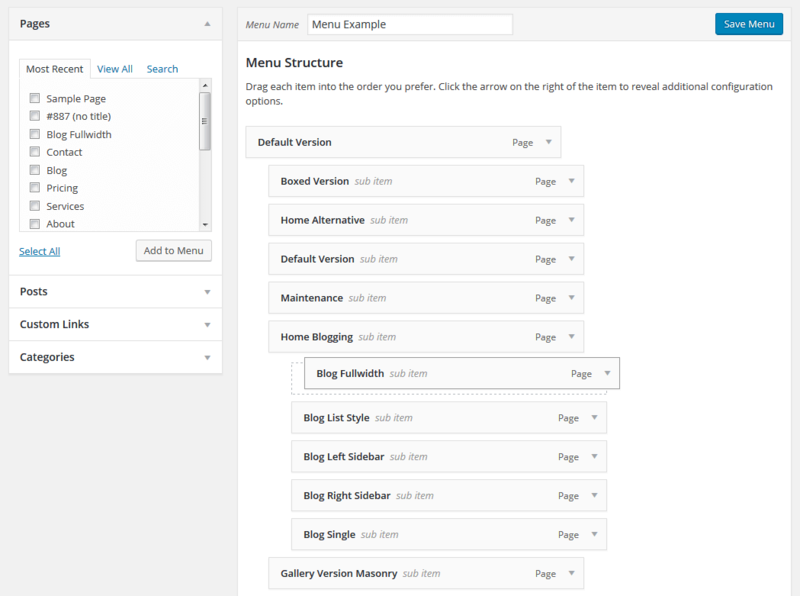 You will see these settings is pretty easy to work with, even though you are new to Wordpress. 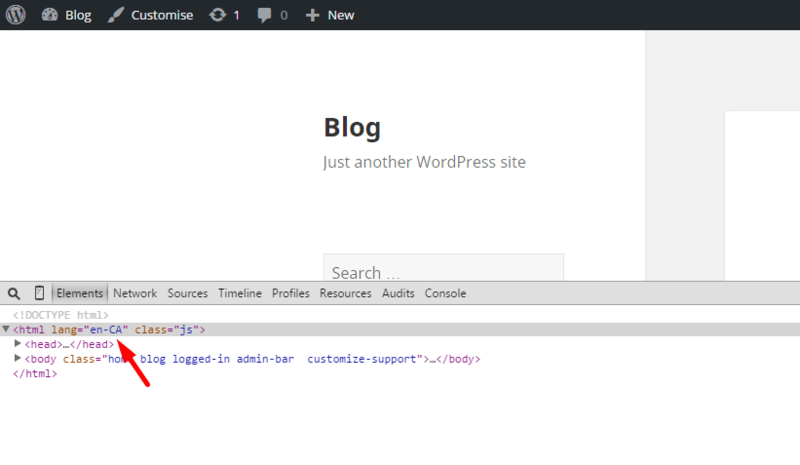 Because it's Wordpress's default customize section. Create, add, remove widget from widget area. These configurations are just like creating widget, add widget to widget area... at admin interface. See Widgets section for detailed instructions. To make it fast, we created one for you. Just open your purchased package and you will see it. 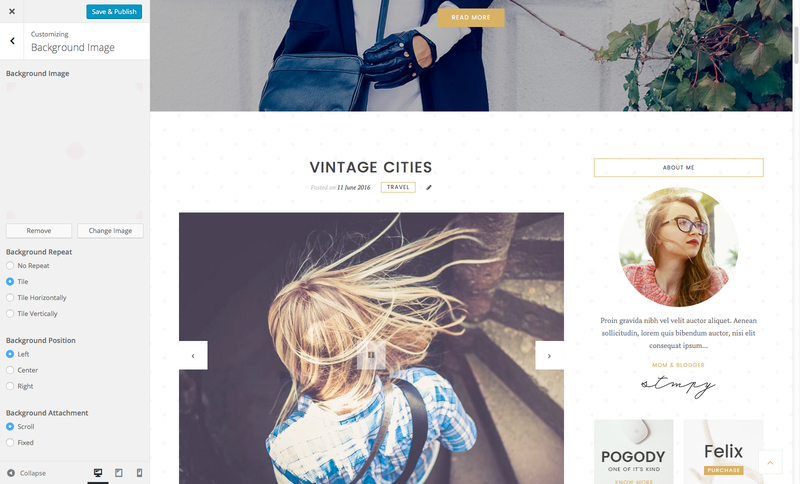 We need at lease style.css and functions.php inside child theme directory. 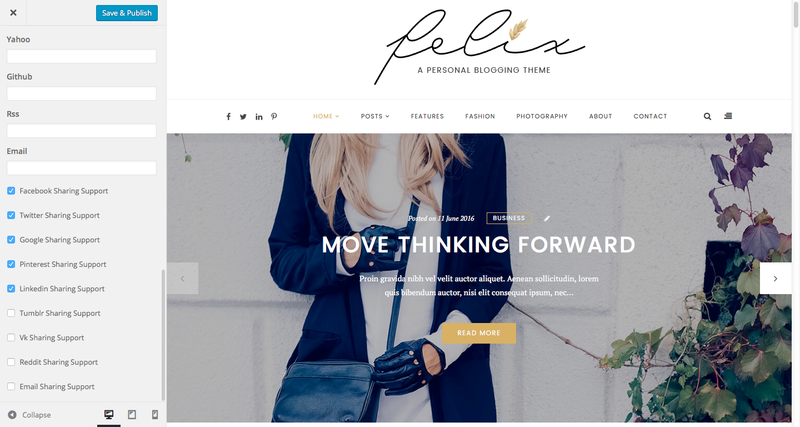 WPFelix has built-in instagram and latest tweets widget which allows you to display your instagram photos and latest tweets from your twitter. However you can also disable these and pick any other plugin to do it for you. We also created few fields for user information to show user's social profile links. You could disable this with a function. 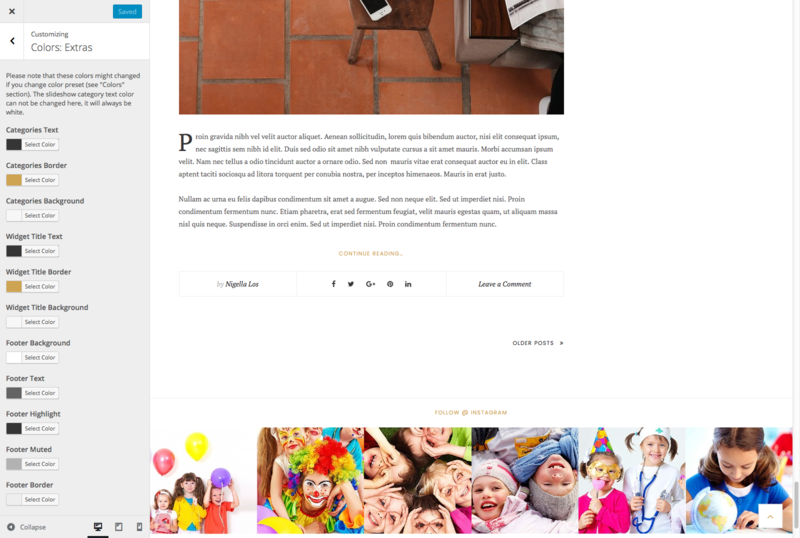 In this section, we're going to change theme fonts using child theme. Please follow instruction described at previous section to make a child theme. 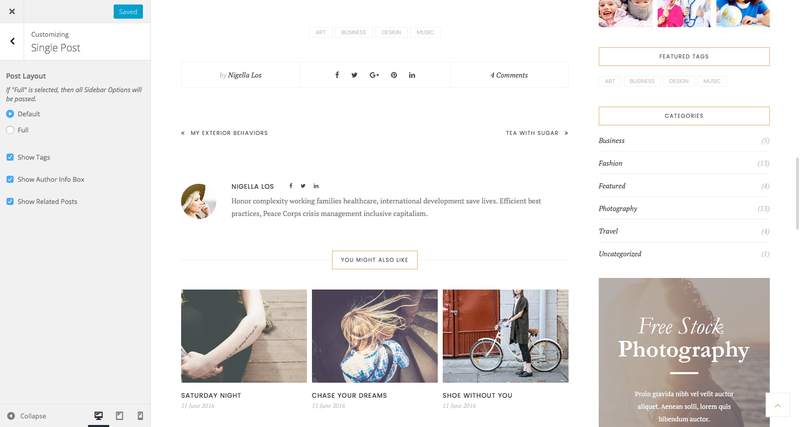 Inside child theme directory, please open style.css and paste in following code. Make changes to suit your needs but keep Template as it is. 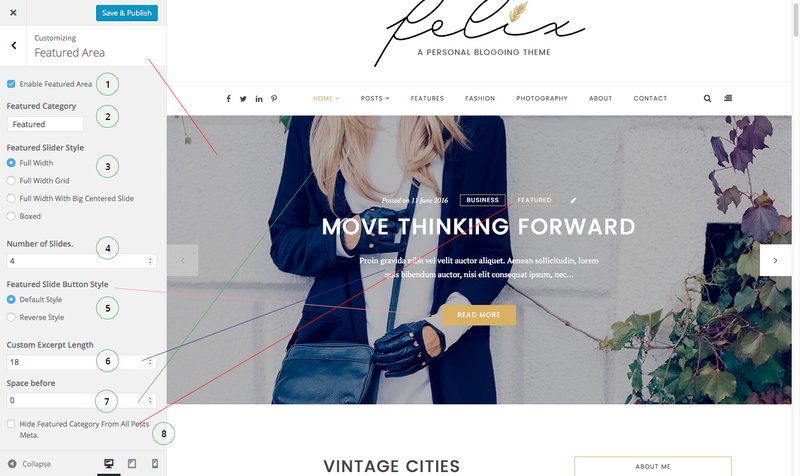 * Register Google fonts for wpfelix. 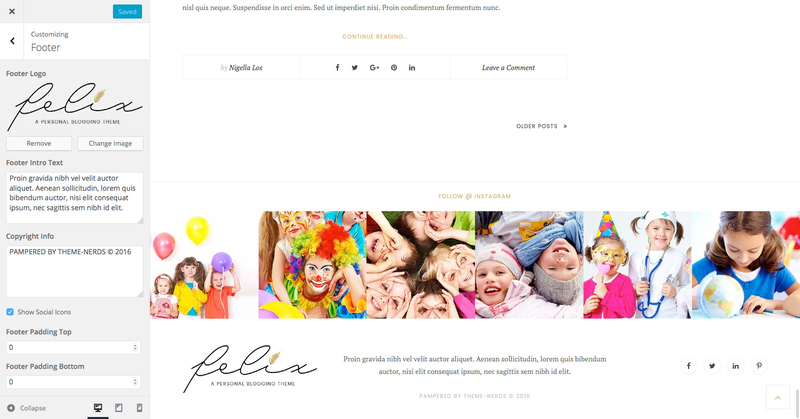 * Create your own wpfelix_fonts_url() function to override in a child theme. Now your fonts are ready, you just need to open style.css and append font-family to specified CSS selectors like bellow. In this example we already included all CSS selector for elements that use heading fonts. That's it, open your site and check. 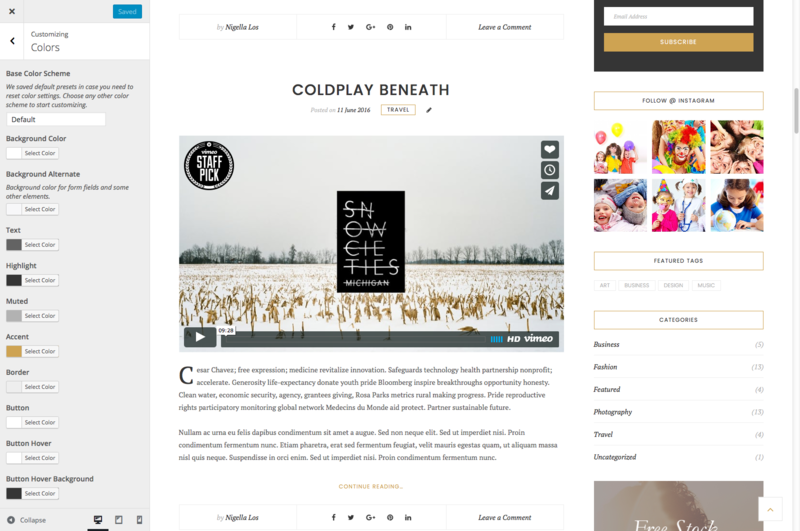 In this section, we're going to change theme fonts using google fonts and a plugin. We're recommended Easy Google Fonts plugin for this purpose. You can also find recommended plugins at Recomended Plugins notice or Appearance / Install Plugins after install the theme. The theme is compatible with WPML plugin, thus can be translated into multiple languages. Follow this link for guide. You can also use POEdit plugin for translation. Located the .po and .mo files in folder /languages. Select language in admin options. Find language code (save option and reload front-end view html). Copy two files .po & .mo and rename them with the code you've just get from previous step ( eg: en_CA.mo & en_CA.po ). Same for other languages. 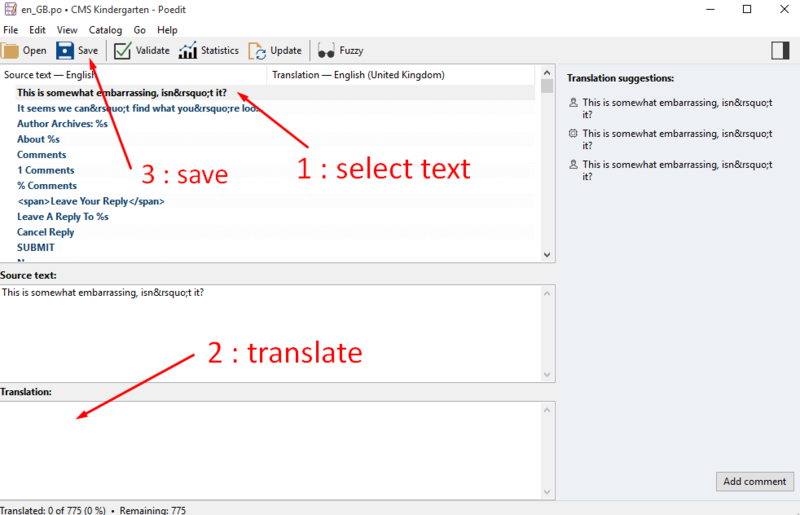 Open the file .po with POEdit and translate the texts into your preferred language. When complete, you’ll want to save the file twice, as two separate files – a .po file and a .mo file. When you save the files, you must name them according to your language code. 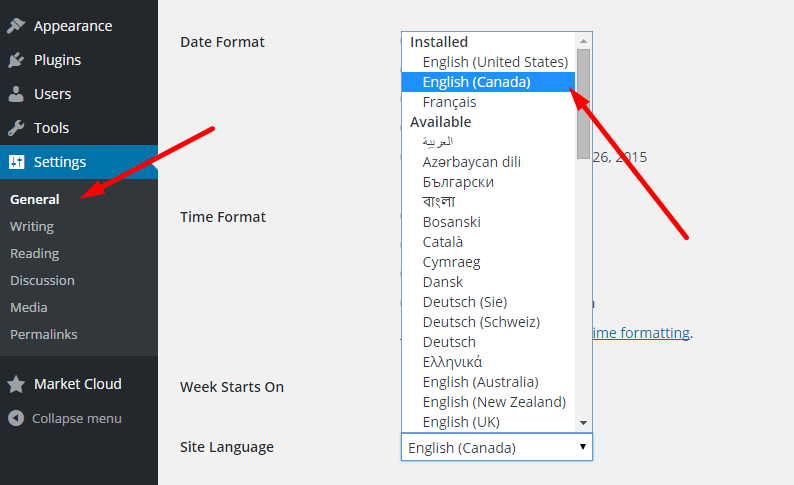 Find a list of language codes at WordPress in your Language. As an example, the language code for English is en_EN, so you would save the translated files as en_EN.po first, then en_EN.mo. When you're done, simply upload the files to your theme's language folder. If you have any troubles while using auto update (It is likely to be a permissions issue) then you may want to manually update the theme via FTP or Cpanel. The team at Farost are always happy to help you with any questions or recommendations you have about the theme.